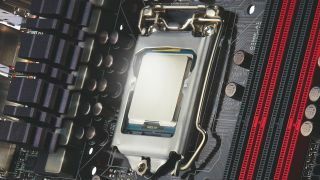 Intel announced that is introducing an entry-level Ivy Bridge Core i3 chip starting June 24. Back in April Intel launched its third generation of processors known as Ivy Bridge. Ivy Bridge chips shrunk Intel's existing i5 and i7 high-performance chips from a 32nm production process to a new 22nm chip using Tri-Gate transistor tech. The result is a more efficient processor, providing great performance while consuming less power, and at a lower price. However, at the time Intel didn't upgrade its entry-level notebook processor, the i3 chip, to Ivy Bridge. That is exactly what Intel plans to fix, announcing that Ivy Bridge Core i3 chips will be available in late June. Intel was previously thought to have the Ivy Bridge Core i3 chips ready in time for the holidays, so a late June release is quite ahead of schedule. There's a very good reason for the timing bump, or at least we can speculate one: This should put the first line of entry-level Ivy Bridge i3 notebooks on store shelves in time for back to school sales. An affordable baseline notebook with new chips sounds like just the thing for students as they trudge back to classes in the fall, so expect some new hardware to start popping up making quick use of Ivy Bridge Core i3.